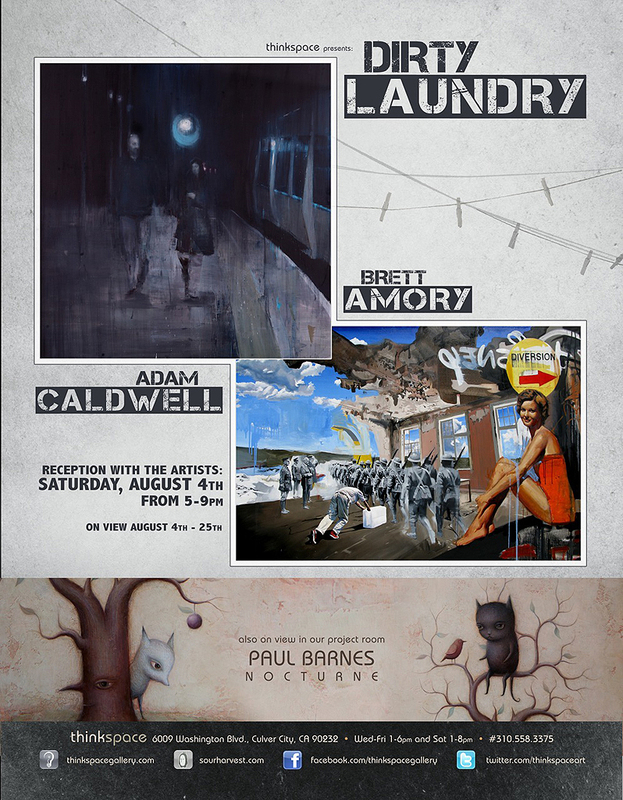 Nocturne features new work by Scottish artist Paul Barnes. This body of work is whimsical, and delights in the suggestion of the fantastic and the surreal. The childlike creatures from Barnes‘ Nocturne seem to exist in a fugue state, dreamy and veiled, dissociated and wandering. Just as the exhibition’s title suggests, Barnes’ work is shrouded in this twilight haze of the outré, and the sleepy other worldliness of the dream state. These pieces are glimpses into a limitless fantasy of legend, dream, and play. Much in keeping with the symbolist tradition, but reinvigorated by a contemporary illustrative aesthetic, the work is symbolically suggestive and resists literal meanings. 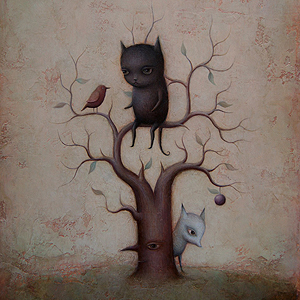 The dream state’s associative work is evident in the host of characters the pieces present, ranging from trees with eyes to owl like creatures emerging from darkly recesses. An innocence and calm pervades Barnes’ work. The strange comes from the quiet of sleep rather than from the violence of the sinister. The Nocturne’s realm is quiet calm. Associative, strange, and beyond waking cognition, this world is a fog of poetic play; a “dreamed” imaginary of creatures, and scenarios, entirely of the artist’s imagining. An unfettered childlike delight emerges from these scenes. From a world of extended metaphor and gentle strangeness, Barnes captures our imaginations and depletes our adult resistance to fantastical possibility. The artist’s work is informed by the legend and magic of folklore; an influence apparent in this childlike imaginary of gentle, foggy, creatures in half waking dream states.